Added explicit dependencies on libm and libdl to the egenix-mx-base package. This is needed for platforms where Python itself does not already link against these, e.g. Mandriva. Added new API mx.Tools.dlopen() function which allows importing shared libs on Unix by pathname (only available on Unix platforms). This can help in cases where you e.g. cannot adjust LD_LIBRARY_PATH. Added new optional API mx.Tools.setproctitle() to set the process title. 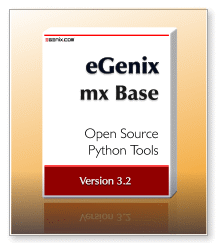 To enable the API, define the compile time symbol HAVE_PY_GETARGCARGV in egenix_mx_base.py. Added builtin aliases binary() and boolean(). Added builtin alias datetime() for mx.DateTime.DateTimeFrom(). This requires mx.DateTime. Note that Python 2.2 introduced a few builtins having the same name as the ones installed by mxTools. mxTools never overwrites Python builtins, so the semantics you get are those of the Python builtin APIs. Fortunately, the differences are only minimal. Fixed a bug in mx.Tools.class_attributes(). Fixed a long-standing bug in mx.Tools.basemethod() that caused lookups to sometimes fail for mixin classes. The bug was related to the caching code, which prevent a correct recalculation. Removed config.h include from xmap.c -- this was never really needed and causes problems with Python 2.2. Thanks to Gerhard Häring for finding this one.